تولید محتوای اثربخش در تبلیغات رسانه‌های دیداری، نیازمند تسلط بر اصول و روش‌های اثرگذار بر کارآمدی تبلیغات است. تولید محتوای اثربخش به‌جای تأکید بر محدودیت تبلیغات بازارهای رقیب (سیاست­‌های سلبی) به رقابت‌پذیری و حق انتخاب آزادانه مخاطب احترام می‌گذارد (سیاست‌های ایجابی). با توجه به مشکلات به‌کارگیری سیاست‌های سلبی از یک‌سو و افزایش رقبای داخلی و خارجی برای رسانه‌های دیداری در ایران از سوی دیگر، لزوم توجه به سمت عرضه‌کنندگان محتوا (سیاستگذاران و تصمیم‌گیران رسانه) از اهمیت بسزایی برخوردار است تا بتوانند با تولید محتوای مناسب و جذاب برای تقاضا (مخاطبان)، با رسانه‌های رقیب به رقابت بپردازند؛ بنابراین، هدف از این مقاله، ردیابی و تحلیل شاخص‌ها و زیرشاخص‌هایی است که بر سواد تبلیغاتی تولیدکنندگان تبلیغات در رسانه‌های دیداری، اثربخشی بیشتری دارند؛ تا به کمک این شاخص­‌ها عوامل اثرگذار بر تولید تبلیغات در رسانه‌های دیداری ایران ارزیابی و الگوهای آموزشی برای افزایش سواد تبلیغاتی طراحی شود. روش تحقیق این مقاله، تحلیل اسنادی (برای یافتن شاخص­‌های عینی اثرگذار بر سواد تبلیغاتی)، تحلیل پیمایشی (برای یافتن شاخص­‌های ذهنی اثرگذار بر سواد تبلیغاتی) و تحلیل تلفیقی برون‌دادهای حاصل از این دو مرحله است. یافته اصلی پژوهش نیز معرفی 10 شاخص به‌عنوان مهم‌ترین شاخص­‌های اثرگذار بر سواد تبلیغاتی مدیران رسانه‌های دیداری ایران بوده است. 2Full Prof. in Planning and Developing in Higher Education, Islamic Azad Uni. 3Full Prof. in Communication and Management, Islamic Azad Uni. Producing effective content of media advertising needs mastering the principles and methods affecting the efficiency of advertising. Producing effective content respects competing and authority to choose among audiences (empowering approach) rather than the emphasis on constraining marketing advertisement of competitors (constraining approach). Regarding the problems of implementing constraining approach on the one hand, and increasing the domestic and foreign competitors for the visual media in Iran, on the other hand, considering content providers (media policy and decision makers) is very important, so that they can compete in the competitive media markets by producing attractive and appropriate content for the demand (audience). 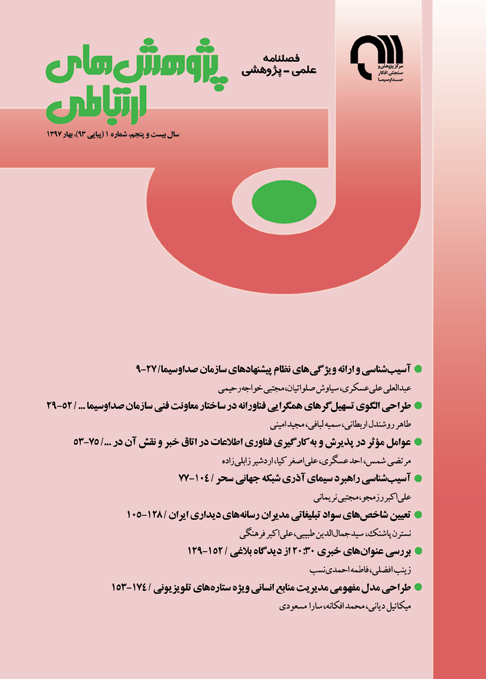 Therefore, the purpose of the study is to track and analyze the major and minor factors that are more influencing on promoting the producers advertising literacy in visual media, so that the factors influencing the production of advertising in the Iranian media are to be evaluated and educational models designed to increase advertising literacy. The research method was documentary analysis (to find objective elements influencing advertising literacy), survey (to find subjective elements influencing advertising literacy) and comparative analysis on the outputs derived from the first two methods. The main findings of the study were identifying 10 factors as the most important influencing advertising literacy of media directors in Iran. بینگر، اتولر. (1376). ارتباطات اقناعی (ترجمه علی رستمی). تهران: مرکز تحقیقات صداوسیما. پاشنک، نسترن و تارانتاش، مسعود. (1393). بررسی مدلی به‌منظور ارزیابی کیفیت اصول اخلاقی در ارتباطات اقناعی. فصلنامه مطالعات رسانه‌ای، 9 (3)، صص 138-127. ساروخانی، باقر. (1383). اقناع غایت ارتباطات. نشریه علوم اجتماعی، 11 (3)، صص 116-93. سلطانی‌فر، محمد. (1387). سواد رسانه‌­ای یا سانسور. پژوهشنامه سواد رسانه‌­ای، 22، صص 56-33. شکرخواه، یونس. (1385). سواد رسانه‌ای یک مقاله عقیده‌ای.‎ نشریه رسانه، 17 (4)، صص 32-27. فرهنگی، علی­‌اکبر. (1387). ارتباطات اجتماعی سالم با رسانه‌­ها از طریق سواد رسانه­‌ای. پژوهشنامه سواد رسانه‌ای، 22، صص 103-85. گیل، دیوید و بریجت، آدامز. (1384). الفبای ارتباطات ( ترجمه رامین و همکاران). تهران: مرکز مطالعات و تحقیقات رسانه‌­ها. Aufderheide, P. (1993). Media Literacy. A Report of the National Leadership Conference on Media Literacy. Aspen Institute, Communications and Society Program. Calfee, J. E. & Ringold, D. J. (1994). The 70% Majority: Enduring Consumer Beliefs about Advertising. Journal of Public Policy & Marketing, Pp. 228-238. Deahl, E. (2014). Better the Data you know: Developing youth Data Literacy in Schools and Informal Learning Environments. Massachusetts: Department of Comparative Media Studies, Massachusetts Institute of Technology. Donsbach, W. (2008). The International Encyclopedia of Communication. Wiley Publishing. Hobbs, R. & Frost, R. (2003). Measuring the Acquisition of Media‐literacy Skills. Reading Research Quarterly, Vol. 38, No. 3, Pp. 330-355. Johnston, B. & Webber, S. (2000). Towards the Information Literate Graduate: Rethinking the Undergraduate Curriculum in Business Studies. Lifelong learning Cconference: Selected papers from the Inaugural International Lifelong Conference, Yeppoon, Quensland, Australia. Kleebpung, N. (2010). Advertising and Media Literacy: Young people and their Understanding of the World of Advertising in Australia and Thailand. Melbourne: Faculty of Arts, Education and Human Development of Victoria University. Lee, W. C. L. (2003). Clash of the Titans: Impact of Convergence and Divergence on Digital Media (Doctoral Dissertation, Massachusetts Institute of Technology). Malmelin, N. (2010). What is Advertising literacy? Exploring the Dimensions of Advertising Literacy. Journal of Visual Literacy, Vol. 29, No. 2, Pp. 129-142. McLuhan, M. (1965). Understanding Media: The Extensions of Man. Cambridge: MIT press. Schultz, D. (2004). Encyclopedia of Public Administration and Public Policy. Facts on File, inc: New York. Tellis, G. J. & Ambler, T. (Eds.). (2007). The SAGE Handbook of Advertising. Sage. Tellis, G. J. (2003). Effective Advertising: Understanding when, how, and why Advertising Works. Sage.